TNT Order New Comedic Drama “Highlands” Starring Margaret Cho To Pilot. 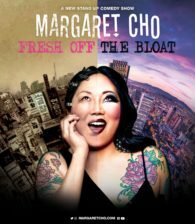 The initial “Fresh Off The Bloat” tour dates go on sale Friday, July 21 here: http://margaretcho.com/tour/ – Please note that the December 6 show in Belgium will go on sale July 20. Additional dates to be announced in the coming weeks. Margaret’s new TV project Highland has been picked up for pilot by TNT Network. Highland will chronicle what happens when two extended, dysfunctional Korean-American families who share the same patriarch must come together after tragedy strikes. As it turns out, the most reliable person in both families is the one who just got out of rehab.